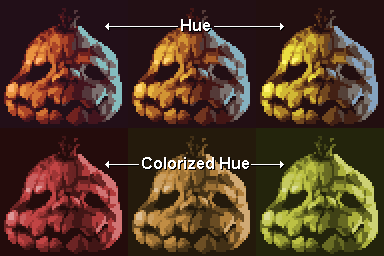 Making a palette is hard, especially in programs such as paint where you adjust colors one at a time. The hardest part is getting started, but what you need to remember is that the palette you start with can be very different than the one that is used for your final piece. 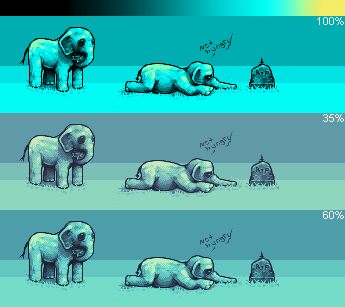 Colors constantly need to be tweaked in order to fit in correctly, and you can’t always predict what’s going to happen. Luckily Photoshop makes this easy. Take a look at Photoshop’s Image > Adjustments menu. There is a whole lot of things there. I’m going to go through all the ones I think you should know about. There’s no secret to finding the right settings, you just have to use your eye and adjust the sliders until it looks right. 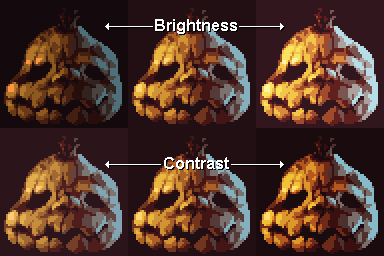 95% of the time, newer pixel artists don’t add enough contrast, so this is something you should use often. You don’t even have to save the changes, it’s just useful to frequently evaluate “what would this piece look like with more contrast?”. I think a lot of the time you’ll find that it will look better. 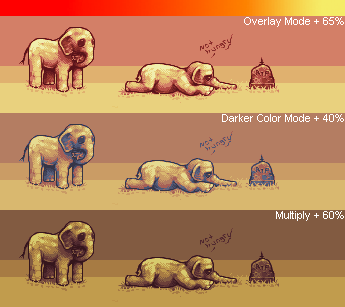 For a more precise adjustment of contrast, try playing around with the Levels and Curves tools. I still don’t 100% know how Vibrance and saturation differ, but you’ll notice that it IS slightly different than saturation. I believe it also adjusts the luminosity of colors. A lot of people have too much saturation when they first start out. I know you want bright, fun colors, but you can do that without burning out my retinas. Colors palettes are all about how the colors relate to each other, so base your decisions on that, not how the colors look on their own, or what numbers they’re made up of. 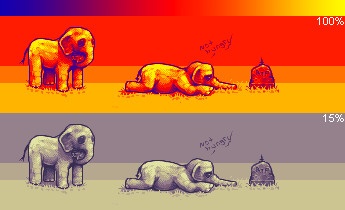 This has the saturation and the brightness slider from the previous two, but also has the hue slider, which lets you shift all hues in your piece at the same time, which can be nice. A little shift to the left or right could be just the thing your piece needs. There is also another option on this screen, a little checkbox called Colorize. What it does is set the entire piece to have the same hue. You’ll notice how I lost the blue highlight with this one. Unfortunately it leaves you with a very flat, static palette. You should never use this on your piece unless you are going to combine it with some of the other techniques on this page. Color balance is similar to shifting hues in the Hue & Saturation tool, with a little more control. That is, if you leave it set to Midtones. You’ll notice there are two other options at the bottom, Shadows and Highlights. Voila! We’re essentially back to my original palette (minus the blue highlights, you’d have to do that separately). 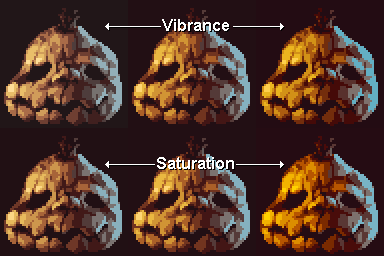 You can see how helpful these tools can be in improving your palette. This is a great tool, that I now can’t live without. Or, turn the fuzziness down to 0, and it now lets you change a single color all throughout your piece by moving the sliders. 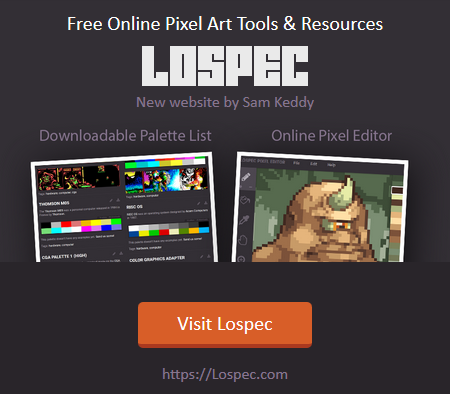 I highly recommend adding a hotkey for this tool, because if you’re like me and like to perfect the palette as you work, you’ll need this nonstop. I use CTRL+SHIFT+R (you’ll have to overwrite some other dumb tool that no one cares about). The best part about this is it happens live, so you can fine tune the colors in your piece. If you’re a fan of magic, you’re going to like this tool. It has a couple uses. What it does is it recreates your palette, from light to dark, in whatever gradient you use. If you put black on the left, and white on the right, you’ll have a gray scale picture. If you have black on the left and red on the right, you’ll have a picture that goes from black to red instead. But you can use any gradient you want. This is a great way to kickstart or redesign your palette. It is sometimes hard to get the perfect color though, so you may need to do some adjusting afterwards. Copy your whole piece onto a new layer, and put that layer on top. Put an effect on this layer, such as the gradient map. Then lower the opacity of the layer. Let me show you what it looks like. We’ll play around with this old piece of mine, Not Hungry. I picked this one because it has a simple, single-ramp palette. The blue to red to yellow gradient is a preset within photoshop. I usually drag the blue in so that the darkest color is pure blue, then yellow with the lightest highlight. It’s an easy way to hue shift your palette. This is another one that will help you hue shift. It’s almost a preset in photoshop, you just have to get rid of the red at both ends. Luckily you can save gradients for later use. 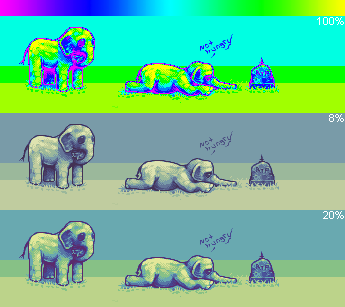 You can see at a low opacity this has a nice calm feeling, or you can crank it up to get a bright cartoony look (doesn’t really work for sad elephants though…). I just made this one up on the spot. You should play around until you find something that feels right. And make sure to compare it to the original so you know if it’s an improvement or not. The best part is you can lower the opacity before you open the Gradient Map tool, so you can get a good idea of what it will look like. Last gradient. You can see how different colors can give the piece a completely different feel / atmosphere / energy / climate. 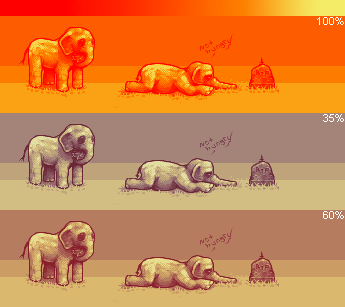 Once you have a gradient you like, there’s a lot more you can change than just the opacity. 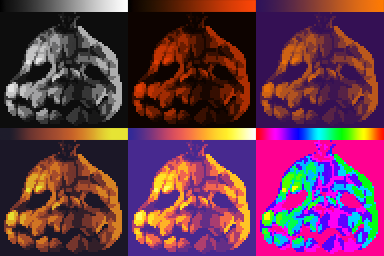 The layer mode can have a huge affect on the colors as well. There are many to pick from, so try them all out. This DOES have a different effect than if you just increased the saturation by 30%! There’s an endless number of ways you can play around with your palette. There’s no secret one-adjustment-fits all that will make everything you do awesome, but hopefully you can use these techniques to try new things that you may not have thought to do. It could even just give you ideas of what colors to try in your next piece. 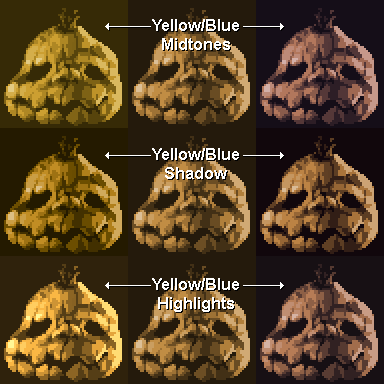 One last disclaimer: You will almost always want to adjust the palette by hand after making overall adjustments. You can’t expect a computer to make something perfectly visually appealing to humans. That’s your job!